The club now has a group on Facebook for St. Helens MC members. You will need to have already joined Facebook to be able to join the group and contribute to the articles and discussions on the page. After you have signed up, visit the St. Helens MC group page and click the link "Request to Join Group" which is on the right-hand side of the page under the photo. Hi good to see this up and running, its going to be a great tool for the club. All meets co-ordinators should be members of this so they can commuicate on their trips, venues last minute changes etc. And all members interested in going on meets should be members. They can then escape the wall, the walls are closing in on me and break out into the fresh air, gulp!!! As he says, it would be particularly helpful if meet coordinators could use this facility to keep members informed of their plans. This should be especially useful in attracting those members who are unable to attend the Wednesday evening meets at The Abbey. 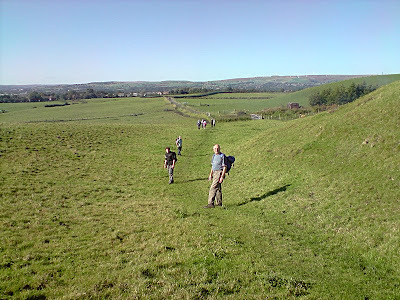 This is Dave Connelly's report on the ramble round Tandle Hill, exploring both the countryside and also the rich social and industrial heritage to be seen in the area. Attendees:- Dave Connelly, Ben Connelly, Les Berry, Carol Baxendale, Ken McWilliam, Ken Fyles, Derek Hatch, Lionel Greenslade(+ 1 guest), Ken Hollis(+ 3 Guests), Keith Halliwell, Bill Clayton and Roger Sager. The walk was approx. 8miles in and around Tandle Hill Country Park and the Rochdale Canal with Lunch at the Summit Inn(Royton). Tandle Hill Country Park is in the town of Royton, in the Metropolitan Borough of Oldham, Greater Manchester, England. It consists of approximately 110 acres, a combination of beech woodland and open grassland. The park contains a countryside centre (opened in 1994), picnic areas, children's play area and numerous trails and paths into the surrounding area. It is a popular route for walkers in the region. In fine weather conditions, it offers views of Manchester and even the Welsh mountains. Tandle Hill Park and Woods. These grounds are the gift of Norris Bradbury Esq. J.P. of Tynwald Mount, Shaw Road Royton as a thank offering for peace after the Great European War 1914-1919. 6th September 1919. 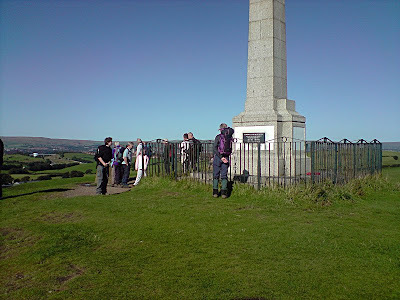 Tandle Hill was formally designated as a Country Park on 1 July, 1971. First World War stands at the highest point in the park, and was unveiled on 22 October, 1921 by the Earl of Derby. Originally the memorial, which is constructed from Portland stone, bore plaques listing the fallen and a bronze statue. The original plaques were stolen in 1969, and replacements were later installed in the grounds of St Paul's Church, Royton. The Rochdale Canal is a navigable "broad" canal in Northern England, part of the connected system of the Canals of Great Britain. The "Rochdale" in its name refers to the town of Rochdale, Greater Manchester, through which the canal passes. The Rochdale is a Broad canal because its bridges and locks are wide enough to allow vessels of 14ft width to pass through. The canal runs for 32 miles (51 kilometres) across the Pennines from the Bridgewater Canal at Castlefield Basin in Manchester to join the Calder and Hebble Navigation at Sowerby Bridge in West Yorkshire. As originally built, the canal had 92 locks. Whilst the traditional lock numbering has been retained on all restored locks, and on all the relocated locks, the canal now has only 91 locks. The former locks 3 & 4 have been replaced with a single deep lock (Tuel Lane Lock), which is numbered as "3/4." 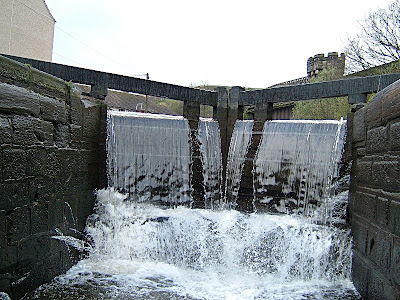 A lock on the Rochdale Canal with water flowing over the gate due to the lack of a side channel. The Rochdale Canal was conceived in 1776, when a group of 48 eminent men from Rochdale raised £237 and commissioned James Brindley to conduct a survey of possible routes between Sowerby Bridge and Manchester. He proposed a route similar to that built, and another more expensive route via Bury. Further progress was not made until 1791, when John Rennie was asked to make a new survey in June, and two months later to make surveys for branches to Rochdale, Oldham and to some limeworks near Todmorden. The first attempt to obtain an Act of Parliament was made in 1792, but was opposed by millers, concerned about water supply, and it was not until 4 April 1794 that an act was obtained which created the Rochdale Canal Company and authorised the construction of the canal. Further acts of parliament were obtained in 1800, 1804 and 1806, the main purpose of which was to raise additional finance. The canal was opened up in stages, as it was completed, with the Rochdale Branch being the first in 1798, further sections in 1799, and the bottom nine locks opening in 1800, so that boats from the Ashton Canal could reach Manchester. Officially, the canal opened in 1804, but construction work continued for another three years. A 1.5 mile (2.4km) branch from Heywood to Castleton was opened in 1834. Because of its width, it was more successful than the Huddersfield Narrow Canal and became the main highway of commerce between Lancashire & Yorkshire. Cotton, wool, coal, limestone, timber, salt and general merchandise were transported. In 1890 the canal company had 2,000 barges and traffic reached 700,000 tons/year, the equivalent of 50 barges a day. But this traffic soon faced competition from the Manchester and Leeds Railway (1841). By cutting tolls the canal managed to maintain business and for a time remained profitable but by the start of the 20th century it was in trouble. In 1923 the canal's reservoirs were sold to the Oldham and Rochdale Joint Water Board. Most of the canal (apart from a short profitable section in Manchester linking the Bridgewater and Ashton Canals) was closed in 1952 when an act of parliament was obtained to ban public navigation (the last complete journey having taken place in 1937) and by the mid 1960s the remainder was almost unusable. With the growth in leisure boating, a campaign was mounted for its re-opening. The first section to be restored was the nine locks between the junction with the Ashton Canal and the Bridgewater Canal, as a result of the Ashton Canal reopening in 1974. The Rochdale Canal Society was formed, and worked hard both to protect the line of the canal and to begin the process of refurbishing it, concentrating on the section from Todmorden to Sowerby Bridge. Nearly 16 miles (25.7km) was opened in this way, with the section from Todmorden to Hebden Bridge opening in 1983, and the entire eastern section up to the summit opened by 1990. The reopened section was still isolated from the canal network. The next success was a re-fashioned link with the Calder and Hebble Canal (which had never closed) at Sowerby Bridge, which joined the restored section to the national network in 1996, and involves one of the candidates for the deepest lock on the British canal system (Tuel Lane Lock at nearly 20ft). In 2000, the canal, which had never been nationalised, passed from the control of the Rochdale Canal Company to the Waterways Trust, and an £23.8 million investment package was announced, with funding coming from the Millennium Commission, English Partnerships, and the councils of Oldham and Rochdale. As restoration proceeded, boats could travel further and further west, and the restoration of the sections through Failsworth and Ancoats were a significant part of the re-development of the north Manchester districts. On 1 July 2002, the restored sections joined up with the never-closed section in Manchester, thus re-opening the canal to navigation along its entire length. On the evening of Saturday 4th of October Richard and AndyG, and also Graham and AndyC, braved the torrential rain to drive up to the club hut in the hope of getting better weather the next day, and being able to do a little climbing. Much to their surprise, given the appalling weather, there were already some members signed in for the weekend. After a short walk into Braithwaite they soon discovered newly-elected Chairman Trevor having a few pints with DaveL and Gareth in the Coledale Inn. 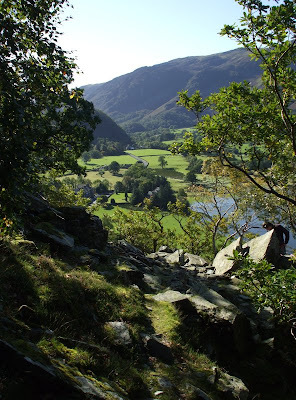 In the morning, after stopping in Keswick for breakfast, Richard, AndyG, Graham and AndyC set off on the short walk in to Black Crag. Unfortunately, two parties of climbers including some beginners were already starting on the only route that looked dry enough to be feasible. So it was eventually decided to walk back along the road and see what was dry enough at Shepherds Crag. 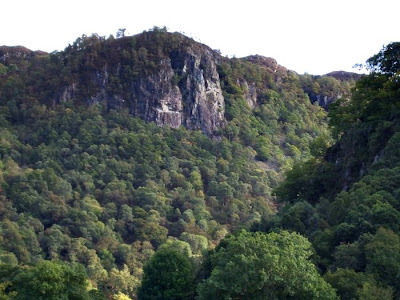 Shepherds Crag was busy and the popular routes around Little Chamonix and Kransic Crack were already busy but Richard and AndyG found Ardus(42m MVS 4a,4a,4b 2*) unoccupied. The first pitch was very testing for Richard due to running water on the sloping ledges, however things improved for AndyG once they were safely established in the corner. Richard also led the exciting final pitch which traverses out of the corner and across the slab to the crack which gives access to the top. 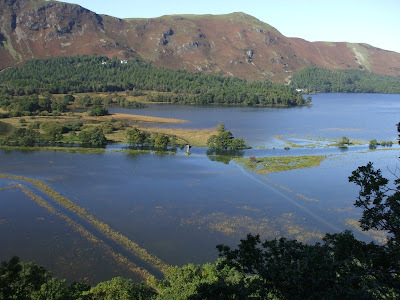 They enjoyed spectacular views of the flooding around the head of Derwent Water. 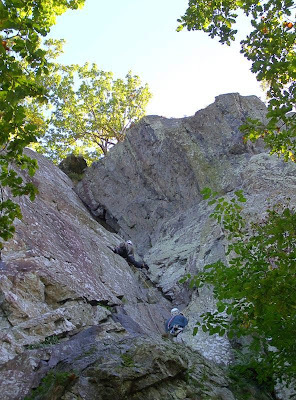 Graham and AndyC returned from Brown Slabs, where they had been warming up on Brown Slabs Direct(38m V.Diff 2*) and then they climbed Ardus too. Meanwhile Richard and AndyG were surprised to find Little Chamonix(70m V.Diff 2*) unoccupied. This is the classic of the crag and ever since Graham had told him, "You're not a proper climber until you've done Little Cham," Richard had been determined to have a go. AndyG ran the first two pitches together to the tree at the botom of the twin vee-corners. Then it was Richard's turn to negotiate the bum-slide off the block under the overhang. Ignoring the traditional saddle-belay, he pressed on up the headwall to the Belvedere. By the time they had descended it was 4:30pm and it was decided to call it a day and start the drive home. A few classics were bagged and the weather turned out great, for once justifying their trust in metcheck.com.